I tell you I really love my Artisan Bread in 5 Minutes a Day cookbook! Can't tell can you, since I have been posting recipes for different breads from this cookbook. Well here is one more you will love! You can make pita from this one also. I made a loaf of artisan for dinner last night and everyone really liked it. My husband is not a big fan of whole wheat bread and he really liked this one. Mix yeast, salt and water in your stand mixer or large bowl. Now you will add all of your flour in at once. Mix until a nice dough forms. Cover and let rise for 2 hours. Now you can either place in a covered bowl for the fridge or break off a grapefruit size piece and roll in your hands until smooth place on stone or Silpat that has been sprinkled with whole wheat flour and let rest for 40 minutes. Slice 2 crosses on top of bread. Preheat your oven to 450' for 20 minutes if using a stone or until your oven reaches 450'. As your oven heats up put a pan on a lower shelf, this where you will add 1 cup of water when you put your bread in the oven. 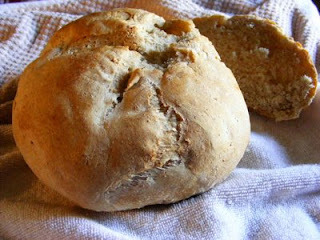 Put bread in and place 1 cup of water in pan and close oven quickly. I leave my ventilation fan on so the steam goes outside. You don't have to but but the steam bugs me. Bake for 35 minutes.